I am totally counting on that whole “March comes in like a lion and goes out like a lamb” thing. A big, soft, cuddly, WARM lamb that is wearing a bikini and has a margarita in her hand. But until the lamb arrives, I thought I’d do a little bird vignette on my living room credenza to get me in a spring state of mind. My vintage bird nest home decor spring vignette. Unfortunately, if I used real birds my dogs would just eat them, so one of my china birds will have to do. This is a real honest-to-goodness bird nest that I found in my driveway last summer. It was just laying abandoned on the ground and since it wasn’t all buggy and wormy I brought it inside for spring decor. The birds probably wouldn’t have used it once it hit the ground, right? If you don’t have access to a real live nest, the craft stores have very realistic nests this time of year. My bird is bone china and is marked Crown Staffs England on the bottom. I believe it’s a male European goldfinch. How do I know? Good old Google came to my rescue. Because honestly, unless it’s a big red cardinal wearing a t-shirt that says “Hey look, I’m a cardinal!”, I’m lost when it comes to bird identification. I see this type of china bird ALL THE TIME at estate sales. I think they’re sort of fun and funky without being all grandma-kitschy. OK, if you have 60 of these things lined up on a shelf, then maybe it would lean toward the grandma-kitschy side, but a few here and there are OK in my book. 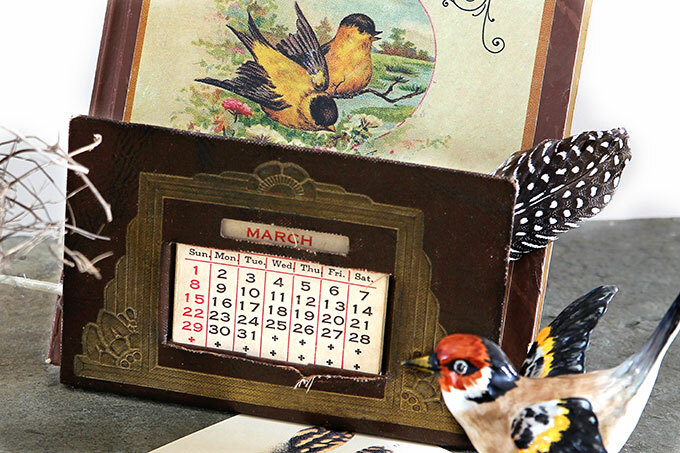 I bought this old perpetual desk calendar at the antique mall a few years ago. It comes with different calendar inserts, so you just flip through and find the one that corresponds to what that month’s calendar looks like (31 days and the month starts on a Sunday) and slide it in. And then slide in the part that has the month’s name and you’re good to go for the next 31 days or so. You can see more of my feathered china friends in The Birds Are Flocking. Have you started decorating for spring yet? Public disclaimer: I don’t condone stealing nests from innocent little birdies. Only use them from the wild if you KNOW no one is going to come back looking them. BTW, the bird feather print is from The Graphics Fairy. My number one source for vintage printable goodies. 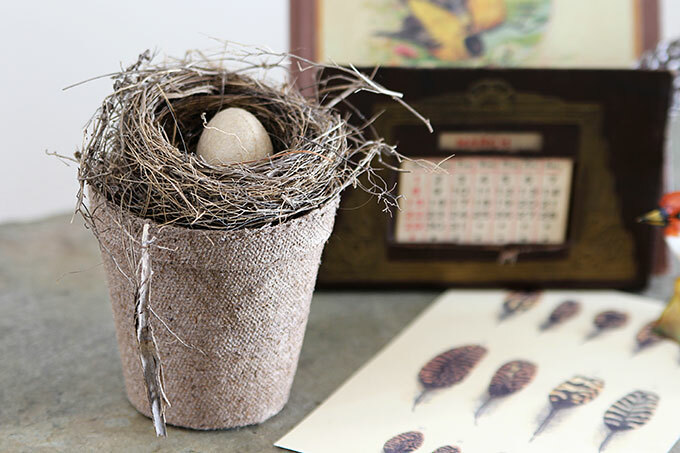 I love all the bird and nest stuff!! Very cute! I’m especially jealous over that calendar. I LOVE your sweet little bird vignette. perfect pick me up for thinking spring. The kids found an abandoned birds nest while trimming the shrubs a couple of years ago. I bought it in and put it with my Spring display. The dogs promptly ate it. Oh, no! My dogs keep sniffing at this one, but I think I have it up high enough they can’t get to it (you never know with these McGyver dogs though). My spring decorating is a clear out. It works for me. Your little bird nest would not be reclaimed; it probably blew down. Your making it hard to wait to decorate until the end of the month (which is my goal seeing as we just got another couple of inches of snow yesterday). Not sure how much longer I’m going to be able to hold out. Your display is so pretty! Oh,my, I truly LOVE this vignette! I am so ready for Spring. I live in Illinois, so I know what you mean about the snow…wow..more coming today too! We had a bad storm last Spring and it blew down a robin’s nest with three babies. one of them died. The other two were just sitting on the ground where anything could get them. I brought them in for the night and they went to sleep in a shoe box with a soft cloth in it. My friend said to feed them bread dipped in milk, and sure enough they ate it up. However, the next day the parents were out there calling and calling, frantically, so I put them back in the nest and tried putting it in a hanging basket on the tree where the nest had been.. The parent’s came with food, but were afraid of the hanging basket and wouldn’t land on it, so we took it down, put it back on the ground and amazingly enough, the parents fed them throughout the day and then they both babies the left nest and hopped and tried to fly. The parents stayed near them, so I guess they survived. My dear husband sat outside all day and kept an eye on them..whew..sorry for the long story….but your little nest reminded me…anyway, it’s very Springy looking and really cheers me up on this ugly cold day. I always love your posts, and yes, like someone said before me, you are so funny. Loving this spring vignette. I have a bunch of Fern Bisel Peat bird prints in our living room that stay up year-round. I finally put away all evidence of snowmen and valentines over the weekend. Perhaps, Mother Nature will eventually get the hint. I think because we had a green Christmas, she’s lingering a bit longer than usual. 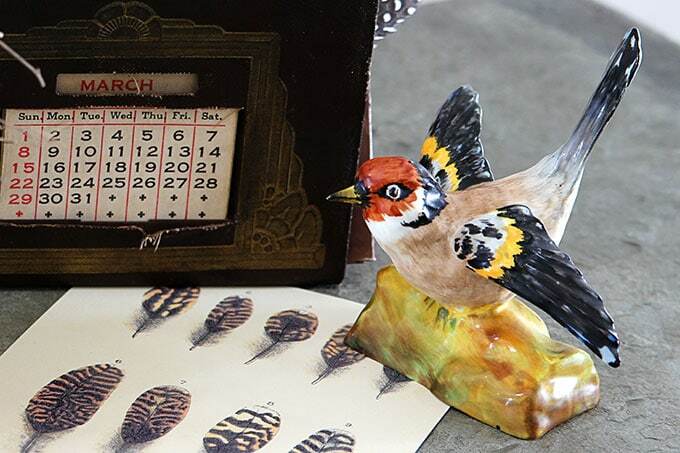 I really like bird themed items; I do have quite a few bird figurines, but I don’ display them all at once! 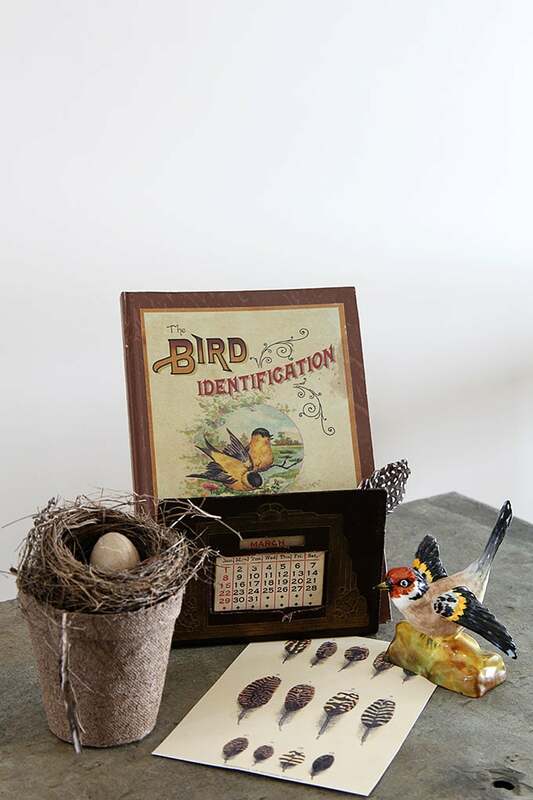 The Bird Identification print is great; is it a book, or a framed print? Another great display from you! I am so with you on Spring coming soon and the whole idea of March in like a lion and out like a lamb. So far I think we are on track in my area. However, we are expecting ice today. I really like the feather prints, they bring you theme together for me. 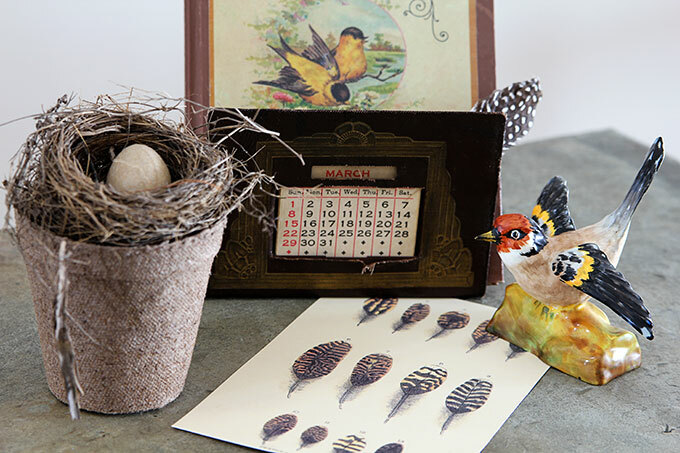 What a pretty little spring gathering you’ve put together on your desk, Pam! I’m afraid our March came in like a lamb, so………..drat! Love it! I have a birds nest I found on the ground last fall. Not sure what I’m going to do with it yet. This is such a charming vignette Pam!! I love all the vintage pieces that you used! Thanks so much for the shout out and link, I’m so happy that you were able to find such a pretty use for that feather print!